The D.C. area is home to thousands of restaurants, and the food editors and critics at Washingtonian pick their top 100. Here are the highlights. WASHINGTON — It took a whole year of eating and roughly 300 meals out for the food team at Washingtonian to identify the region’s best restaurants. But they powered through, and this month, the magazine is out with the top 100. “When we’re sitting down to rank them, we really ask ourselves one very basic question, which is, ‘Which restaurant are we most excited to eat at right now?’” said Ann Limpert, executive food editor and food critic at Washingtonian. For Limpert and her colleagues, the most exciting dinner du jour is at Minibar, a two-star Michelin restaurant in Penn Quarter from D.C.’s hometown culinary hero and global humanitarian José Andrés. Limpert likens the intimate and interactive dining experience at Minibar to a show, even calling the cooking and service an “incredible kitchen ballet.” But tickets to this avant-garde act don’t come cheap: A seat at the chef’s counter is $275 per person; private dining with a wine pairing is $565. That said, each reservation comes with about 20 courses, and none of them disappoint, Limpert said. “This year we found that pretty much each one of those courses were equal parts creative and delicious, and those are two things that don’t often go hand-in-hand,” she added. The founding chef’s good deeds have dominated headlines in recent years (his free kitchen for furloughed workers fed thousands during the 35-day government shutdown), but Limpert said Andrés’ charitable efforts had no influence on Minibar’s ranking. “It was a very happy coincidence,” she said. No. 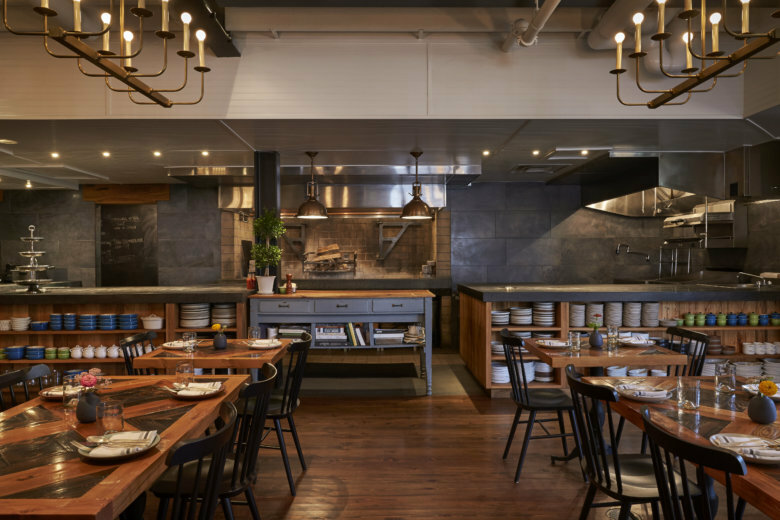 2 on the list is The Dabney, a Blagden Alley restaurant from chef Jeremiah Langhorne that showcases mid-Atlantic cuisine cooked in the embers of a wood-burning hearth. Limpert said while everything on the menu is enjoyable (she and her husband tried to decide on the best dish they had, then realized they couldn’t “because all of them were that good”), the vegetables especially stand out, including the charred brassicas with n’duja hollandaise, mint chimichurri and fried shallots. “So really unexpected, really interesting takes on our regional cuisine,” Limpert said. Third is one of the area’s most well-known establishments: The Inn at Little Washington, which received its third Michelin star in September and just celebrated its 40th anniversary. “It’s classic, American fine-dining with a lot of fun touches sprinkled throughout,” she said. Similar to Minibar, the tasting-menu experience at The Inn comes at a cost: $238 per person for dinner. Still, there are plenty of top-100 options for diners on a budget, including Inferno Pizzeria in Darnestown, Maryland, which takes the No. 11 spot. “It is a tiny, no-reservations pizza joint, and it is very affordable,” Limpert said. Chef Tony Conte’s creations include a pie with organic egg, winter black truffles, San Marzano tomatoes and Fontina cheese. Another is topped with oven-roasted potato, onion, smoked mozzarella and rosemary. A classic D.O.C. margherita rings up $13. Elle, an all-day eatery in D.C.’s Mount Pleasant neighborhood, and No. 7 on the list, is another spot where diners can find a delicious meal that won’t put them in the red. And Limpert said it’s as good in the morning for a breakfast sandwich, as it is for lunch, drinks and dinner. For those in search of options in the suburbs, Limpert recommends El Sapo Cuban Social Club in Silver Spring, Maryland — especially for its vaca frita and Cuban sandwich. “It’s just a party: It is very loud, there’s usually live music, everyone’s drinking their mojitos, and the Cuban cooking is just fantastic,” she said. Bethesda is home to Q by Peter Chang, which Limpert said has the best Peking duck and weekend dim sum, and in Virginia, she points to Clarity in Vienna. Plus, Limpert said chef Jon Krinn changes the menu almost daily and rarely repeats a dish. Washingtonian’s 100 Very Best Restaurants issue is on newsstands now.